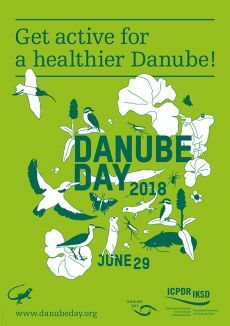 Get active for a healthier Danube in Vienna! The Danube returned to Vienna's Stadtpark, where one thousand children, including a delegation from Romania, enjoyed a day of eco challenges, fascinating facts, creatures, crafts and competitions. Robert Steiner, TV/radio presenter and Danube Day Ambassador, compered the event. A highlight was the Danube Puzzle Race. Children raced around stalls to complete eco activities - solving puzzles and collecting stamps and goodies - to become champions. They heard about aspects of Danube life, with information on the 14 countries, careers and the creatures that depend on our rivers. Get a flavour of the day from Danube Day Austria's video and facebook stream. An exhibition and press event marking 24 years of basin-wide cooperation was held at the Rotunda in the Vienna International Centre. The exhibition highlighted 15 years of Danube Day through film and photographs of the thousands of events and tens of thousands of artworks created to mark the day. As well as ICPDR experts, Pascal Rösler, who traversed 2467 km of the Danube by Stand-up Paddle Board, attended the press briefing and was featured in a documentary at the event. Read more on the ICPDR website. Jugend-Umwelt_Platform JUMP organised the Austrian round of this year's Danube Art Master competition. The 14-country art extravaganza tasked children to create 3D artworks made from materials found by the river or 1-minute videos on how to share and protect the Danube rivers. National winners will go on to the international Danube Art Master final later in the year. To read about how all the countries celebrated in 2018, see Review 2018. You can also revisit 15 years of Austrian Danube Day celebrations via the general Review page. For news of Austria's Danube Art Master contest, view the Austrian factsheet or contact Angelika Rainer of Jugend-Umwelt_Platform JUMP on +43 1 31304 2011; mobile: +43 650 7333 494.